An arrested drug kingpin is transported by a Los Angeles Police Department S.W.A.T. team, led by Jackson's character, out of the city and into federal custody. Plans go awry when the kingpin offers $100 million to anyone who can free him. $37.062 million on 3202 screens. Someday Hollywood will run out of old TV shows to remake as movies. At that point, I guess they’ll need to remake the remakes. But they’re not there yet, which meant the 2003 debut of SWAT as a film. Loosely based on the Seventies TV series, the new millennium SWAT quickly establishes the SWAT (“Special Weapons and Tactics”) team as the guys the regular cops call when they need help. As they handle a bank hostage situation, we meet some of our main players. 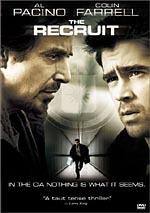 For their activities, Jim Street (Colin Farrell) and his partner Brian Gamble (Jeremy Renner) get demoted from SWAT. Gamble takes a hike, but Street decides to stay, much to the irritation of his buddy, who accuses the loose cannon of cutting a deal to keep his job. Their friendship ends angrily as the psycho Gamble thinks Street betrayed him. The flick then jumps ahead six months, where we see that Street clearly didn’t cut a deal, as he now remains stuck in a menial gun cage assignment. Sergeant Dan “Hondo” Harrelson (Samuel L. Jackson) encounters Street there as he returns to SWAT from another job. The chief wants folks like him to bring back “old school” honor to SWAT to restore some luster to the LAPD’s soiled reputation. Hondo gets the call to find a few new pups for the SWAT squad that he’ll command. This group starts with TJ McCabe (Josh Charles) and Michael Boxer (Brian Van Holt); the latter just happens to be the brother of Street’s recent ex-girlfriend. Hondo gets to know Street as his driver, and the pair encounter the next recruit for the team as he pursues a baddie: Deke Kaye (LL Cool J). They then go to the hospital to connect with Chris Sanchez (Michelle Rodriguez), another badass cop. Inevitably, Hondo eventually chooses Street for the final slot. Hondo encounters resistance to these picks from arrogant Captain Fuller (Larry Poindexter) – the one who demoted Street in the first place – with the caveat that if something goes wrong, he’ll boot Street and Hondo from the force. While this occurs, we meet a Frenchman who arrives into LA. Alex Montel (Olivier Martinez) runs his family’s criminal business and enforces issues with violence. Things go awry when he gets pulled over for a busted taillight in his just-murdered uncle’s car, and the cops pull up a warrant for that uncle. When a discrepancy in his records keeps him detained, Montel gets impatient. As Montel gets transported on a police bus, the authorities finally discover his identity and all his nasty past. They send our heroes as escorts, but it’s too late for that; fellow baddies in cop drag pull over the bus and bust out Montel. However, the SWAT team stops them and recaptures Montel. On the way to prison, Montel declares that he’ll give $100 million to anyone who busts him out of jail. He needs another transport, so our heroes get the assignment. With so much money out there for a jailbreak, clearly some baddies will attempt to snare Montel, which means the SWATties have their work cut out for them. If you hope to find anything original or interesting about SWAT, you’ll have your work cut out for you as well. I suppose it could have been more tedious and one-dimensional, but I find that hard to imagine. Better adapted TV dramas like The Fugitive and Charlie’s Angels did something different and creative with the source material. SWAT, on the other hand, feels like eight million other cop action flicks. I think director Clark Johnson watched too many Michael Bay flicks, for the latter’s influence pervades SWAT. Unfortunately, it’s the uninspired Bay of Bad Boys who inspires SWAT, not the more entertaining Bay of The Rock or Armageddon. Johnson tosses out scads of different techniques in the hope that some of them will fake us out and make us believe he knows what he’s doing. This doesn’t happen. Instead, the mélange of cinematographic formats – along with the requisite quick-cutting and excessive camera movement – just feels desperate. The various elements distract and make the material have less impact than it otherwise might have enjoyed. That’s quite an accomplishment given the tedium of this flick. Almost no parts of SWAT work. The first half of the movie sets up the characters and organizes the team. While that sounds good in theory, especially since so many movies totally eschew exposition in favor of slam-bang action, the characters remain so thin and one-dimensional that all these elements simply bore us. The team could come together in less than half the time and offer the same level of clarity, so the movie really plods in its first half. If SWAT employed an intriguing plot, I could forgive this slowness, but unfortunately, the story seems pretty dull. The parts with Montel don’t kick into gear until past the flick’s halfway point, and that’s really much too long. The tale lacks much intrigue, especially since most parts could be viewed from a mile away; bits that are supposed to come as a surprise are insanely predictable and telegraphed. The second half of the film feels like little more than a compendium of random violence. At least SWAT employs a fairly good cast, though you’d not know that from their work here. Almost all involved seem to view this as a paycheck movie; don’t look for any inspiration or excitement from them. The only moderately pleasant surprise came from Martinez. I’d previously seen him as “the other man” in Unfaithful. Given his semi-wimpy presence in that flick, I didn’t expect to buy him as a credible villain. One-dimensional he may remain, at least Martinez infuses Montel with some decent menace. Check out SWAT for some of the most blatant product placement ever filmed. We don’t simply see Sony products in the background or on shelves; characters carry huge Sony boxes right in front of the camera! Other brands get massive – and obvious – play as well. All of this makes SWAT feel less like a movie and more like a marketing opportunity. Frankly, I think that’s all SWAT is. The movie doesn’t seem to have any real reason to exist other than to capitalize on an old property and launch a new franchise. Hopefully that won’t happen, as we definitely don’t need another crappy action movie like this. Poorly formed and executed in almost every way, this sucker comes as a definite disappointment. 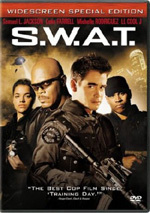 SWAT appears in an aspect ratio of approximately 2.40:1 on this single-sided, double-layered DVD; the image has been enhanced for 16X9 televisions. The movie mostly presented the kind of picture expected of a big-budget Hollywood affair, but it felt short of greatness. Sharpness almost always looked terrific. A slight amount of softness infused a few wide shots, but those instances remained minor. Overall, the flick seemed crisp and detailed. No issues connected to jagged edges or moiré effects occurred, but I noticed a bit of light edge enhancement at times. As for print flaws, these seemed absent, though some artifacting slightly interfered with the image at times. Given the Michael Bay influence seen in SWAT, it came as no surprise that it featured a fairly stylized palette at times. Actually, many of the hues looked fairly natural, but the movie occasionally went for more forced tones. The movie replicated these colors cleanly and accurately. Black levels were nicely deep and dense, and low-light shots came across as distinctive and well defined. Ultimately, while I felt SWAT lacked the polish to merit an “A”-level grade, it still seemed strong enough to earn a “B+”. Some similar thoughts greeted the Dolby Digital 5.1 soundtrack of SWAT. On the positive side, the mix offered a very active affair. From the opening hostage drama and all its gunfire through the movie’s other action sequences, the flick used all five channels on a very frequent basis. Lots of effects elements popped up from the sides and rears to create an aggressive track. Unfortunately, these pieces didn’t always blend together terribly well. I got too much of a “speaker-specific” feeling from the mix at times. Localization appeared a bit too firm, and the elements didn’t mesh tremendously well. These concerns didn’t seem major, but the detracted somewhat from what otherwise would be a terrific track. Audio quality appeared solid. Speech occasionally got a little buried under all the effects, but the lines consistently sounded natural and distinctive. Music was bright and dynamic, with clean highs and good range. Effects were reproduced nicely as well. They always seemed clear and accurate, and they showed terrific bass when appropriate. Low-end came across as tight and bold. The soundfield melded a little too awkwardly to make this a great track, but it seemed pretty satisfying nonetheless. For the supplements of SWAT, we open with two separate audio commentaries. The first includes remarks from director Clark Johnson plus actors Samuel L. Jackson, LL Cool J, Michelle Rodriguez, Josh Charles, Brian Van Holt, and Jeremy Renner. All the actors sit together, while Johnson’s individual screen-specific comments get edited into theirs. Actually, it works the other way around for the most part, as Johnson dominates the piece. The actors contribute little and offer virtually nothing of consequence. They crack on the movie and each other but don’t tell us anything memorable. Johnson helps make this a reasonably entertaining track, however. He stays with basics like locations, stunts, effects, working with the actors, and various logistical challenges such as the problems with filming in LA. Johnson doesn’t go into anything terribly revealing or fascinating, but he provides such a likable and easy-going personality that he makes the commentary work. More than a few gaps mar the proceedings, and the actors’ sections always drag, but the director’s statements enable this track to come across as fairly interesting. On the second commentary, we hear from writers Ron Mita, Jim McClain, David McKenna and David Ayer. (The DVD’s case incorrectly refers to the involvement of a technical consultant.) All four men sit together and provide running, screen-specific comments. In a telling indication of how Hollywood works, early on we learn that some of them never met before this session, and at its best, this commentary gives us insight to the realities of modern script-writing. The four tell us of other projects and specialties and we learn about alterations made between various revisions of the text. They also crack on the movie’s clichés and give us a solid glimpse of their work within the Hollywood system. As with the first commentary, too much dead air appears, though this never becomes pervasive. Instead, the writers’ track provides an informative discussion. Next we get a collection of eight deleted scenes. These last between 18 seconds and 117 seconds for a total of seven minutes, 33 seconds of footage. As usually occurs with action flicks, the character moments get the boot, and that’s what we find here. None of them seem crucial – or interesting, for that matter. A Gag Reel lasts 176 seconds. I normally don’t like these, but this one’s pretty good. It includes amusing bloopers plus a bunch of funny gags like Colin Farrell’s beer, cigarettes and tiny dumbbell workout. The DVD presents five separate featurettes. Anatomy of a Shootout runs nine minutes, five seconds and examines the film’s opening sequence. It mixes movie shots, images from the set, and interviews. We get notes from director Johnson, first assistant director Lars Winther, editor Michael Tronick, location manager Mark Johnson, police technical advisor Randy Walker, supervising sound editor Cameron Frankley, and armorer Mike Papac. They go into the technical elements and logistics of the shoot for this scene. They make this all interesting and not too dry as they provide a lively examination of the sequence. For a look at the film’s inspiration, we go to SWAT - TV’s Original Super Cops. The six-minute and 58-second featurette includes many show clips plus remarks from LL Cool J, Josh Charles, Hollywood Reporter TV critic Ray Richmond, and original actors Steve Forrest and Rod Perry. We get some history of the series and impressions of it. The program provides a fairly generic look at the show, but it gives us decent background notes. The DVD’s longest program, The Making of SWAT runs 21 minutes and 39 seconds. 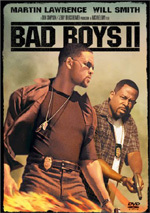 The show includes comments from director Johnson, producer Neal H. Moritz, police technical advisor Walker, former SWAT officer Steve Gomez, SWAT officers Mike Baker and Lee McMillian, and actors Samuel L. Jackson, Colin Farrell, LL Cool J, Brian Van Holt, Michelle Rodriguez, Jeremy Renner, Olivier Martinez, and Josh Charles. The show goes through basics related to the cast, their training, and the story. Expect a lot of happy talk and little substance in this fluffy and generally uninformative piece. Next we get 6th Street Bridge – Achieving the Improbable. In this five-minute and 21-second piece, we find the usual mix of movie snippets, shots from the set, and interviews. We hear from production designer Mayne Berke, second unit director Jim Arnett, visual effects animator Clay Dale, and computer graphics supervisor Micheal Hardison. They go through the work done to create the 6th Street Bridge plane landing; that involves both practical and computer elements. Quick and efficient, the featurette covers the material well and offers a tight little look at the topic. For an interactive featurette, we get Sound & Fury – The Sounds of SWAT. This allows us to get a feel for how the flick’s audio was created. In the “Sounds of SWAT” section, we click on different objects like headphones and weapons to get additional mini-featurettes. “The Sounds of SWAT” features editor Tronick and supervisor sound editor Frankley as they talk about different audio stems used and how they got them in this four minute, 35 second piece. The other elements in this area give us text information about four different weapons plus demos of them. We see film clips that feature the weapons and hear comments about them from armorer Papac and/or police technical advisor Walker. These last between 75 seconds and 130 seconds for a total of five minutes of footage. Also under the “Sound & Fury” umbrella, “Scene Breakdowns” lets us examine audio elements for four different scenes: “Bank”, “Hollywood”, “Ambush” and “Bridge”. Each of these can be viewed with any of four tracks: gunshots, impacts, mechanics, or full gun effects. These allow us a nice way to check out the creation of the audio track. All of them feature full 5.1 sound for each track. Filmographies show up for actors Samuel L. Jackson, Colin Farrell, Michelle Rodriguez and LL Cool J. Finally, we get trailers for Bad Boys II, Once Upon a Time in Mexico, Radio, Underworld, Big Fish and “TV Action Favorites”. Oddly, no trailer for SWAT itself appears. A generic action flick, SWAT brings virtually nothing new to the genre. Had it at least followed its clichés and predictable material in a satisfying way, I’d have enjoyed it, but it seems dull and never does anything to entice the viewer’s interest. The DVD presents generally solid picture and sound plus a good set of extras highlighted by a pair of informative audio commentaries. Fans of SWAT will like this DVD, but I can’t recommend this weak and uninspired movie to anyone else.